The term “crème brulee” literally means “burnt cream.” I don’t know about you but that doesn’t sound very appetizing to me. 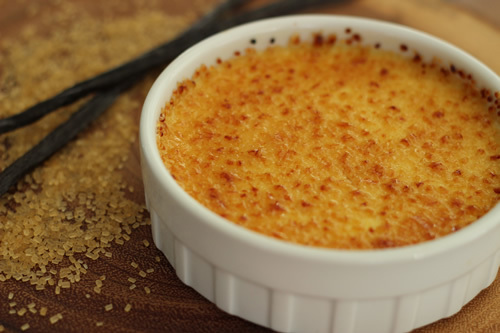 Fortunately I don’t speak French so whenever I hear the term “crème brulee” all I think of is amazing, vanilla, yummy goodness. 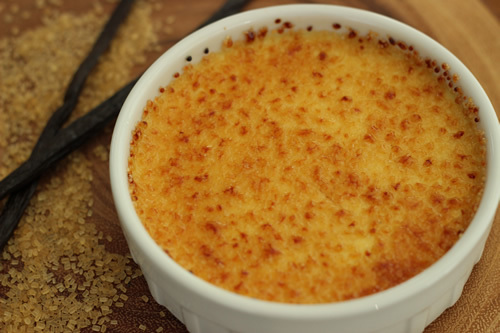 Crème brulee is one of my all time favorite desserts. It is hard to beat the creamy vanilla custard topped with a caramelized sugar shell. There was a time when I wouldn’t have dreamed of even trying to make crème brulee. The fancy French name just made it sound like one of those “beyond my skill set” type of desserts. It wasn’t until I was running on my treadmill one day and watching America’s Test Kitchen (yes, I actually watch baking shows while I work out) that I finally got the nerve up to try it. They made it look really easy. Luckily I had recorded the episode so after my workout I watched the show again and wrote down all the instructions. 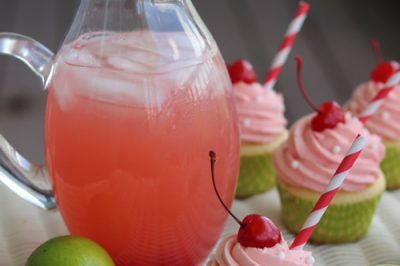 There weren’t many ingredients to it so I figured that even if I totally screwed it up, at least I wouldn’t be out too much money. Much to my surprise I nailed it on my first attempt! Usually I have to try out new recipes at least two or three times before I really get them down, but this really was easy. The most difficult part is just knowing when they are done but even if you over or under cook them slightly they still taste amazing. That was several years ago and I have been making them regularly ever since. Even my youngest daughter started making them on her own when she was just 11 years old, so don’t be afraid to give them a try. One of the things I love about these is that they can be made several days before you need them. You just want to make sure you wait to brulee them (melt the sugar topping on them) about an hour before you eat them, otherwise they start to liquefy on the tops and turn a brownish color. They still taste good but the sugar coating becomes watery and they don’t look appealing anymore. If I am making them for company I always brulee them right before we are going to eat dinner. That allows them time to set up in the refrigerator while we eat and then they are ready for dessert. This works out well because everyone loves to watch me use the torch on them, especially kids, and it gets them excited for what’s to come. Let’s get started. 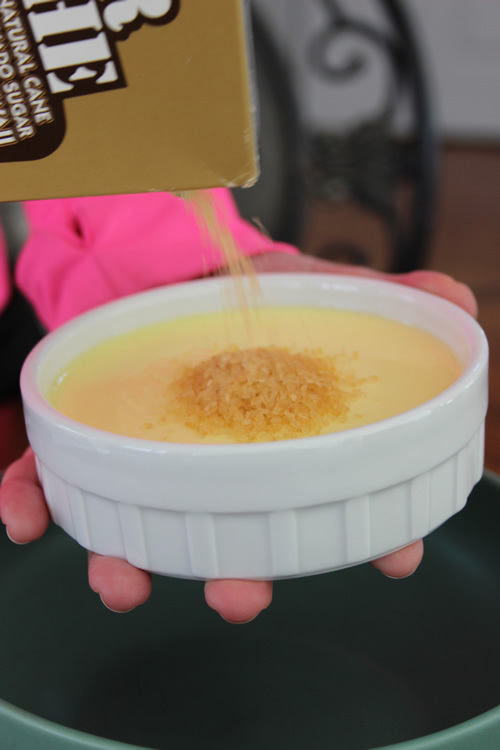 Click here for a printable version of the Classic Creme Brulee recipe. This recipe makes 8 servings. You will also need 8 ramekins to cook them in. 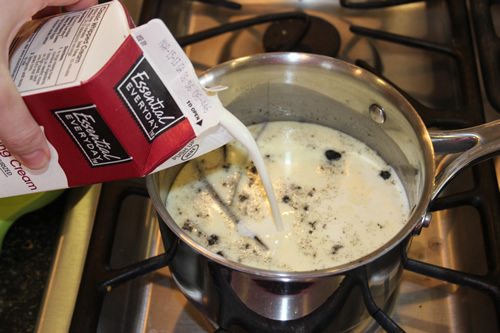 Begin by pouring 2 cups of the heavy cream into a saucepan. 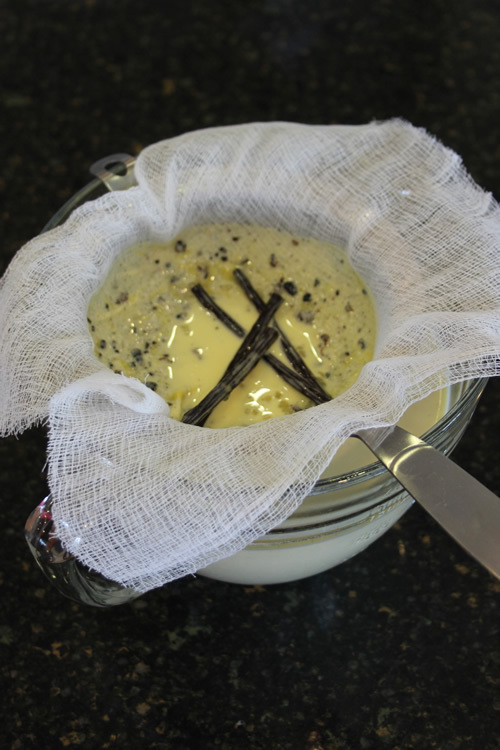 Scrape the seeds from the vanilla bean and add to the cream. If you are using extract, don’t add yet. 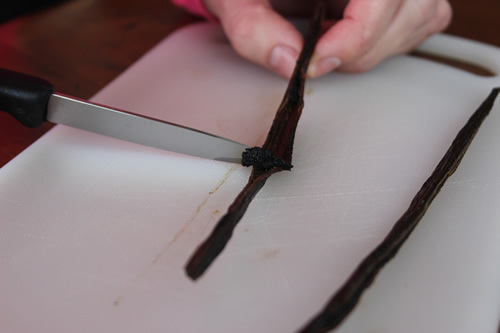 To remove the seeds from a vanilla bean, use a sharp knife to cut the bean in half lengthwise. Holding the end of one of the halves, use the back of the knife and slide it down the bean, removing all the seeds. Add both the seeds and the remainder of the beans to the cream. Also add 2/3 cup granulated sugar and a pinch of salt to the cream and heat the mixture over medium heat until it comes to a boil. Once mixture begins to boil, remove it from the heat. If you are using extract, you can add it to the mixture at this time. Cover and let set for 15 minutes. After 15 minutes, add the rest of the cold cream to the saucepan and stir well. Gently beat the egg yolks in a large bowl. 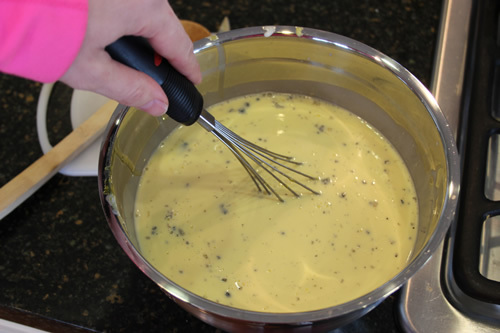 Using a ladle, add one ladle full of the warm cream mixture to the yolks and stir them with a whisk. This process allows you to slowly heat the eggs without cooking them. 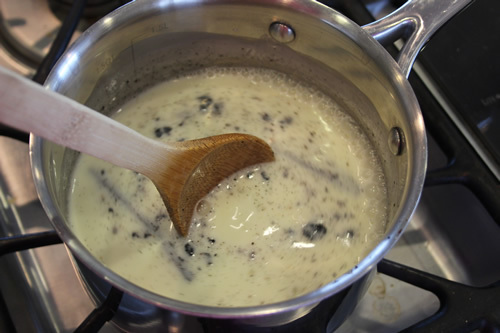 Repeat with another ladle full of the warm cream mixture and stir. 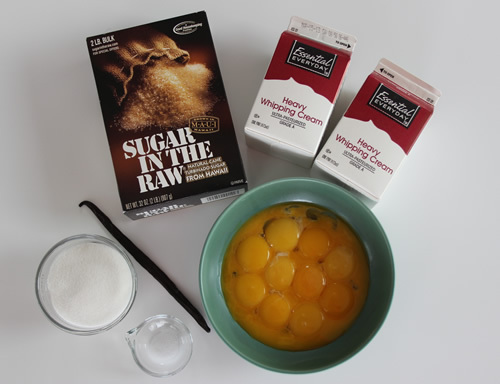 Now add the rest of the cream to the yolk mixture and stir with a whisk until well combined. 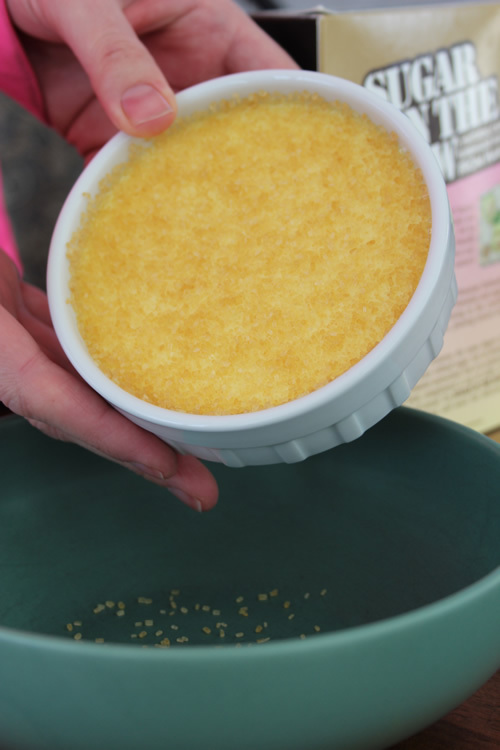 Place a sieve over a pourable measuring cup. Add a couple layers of cheese cloth into the sieve. 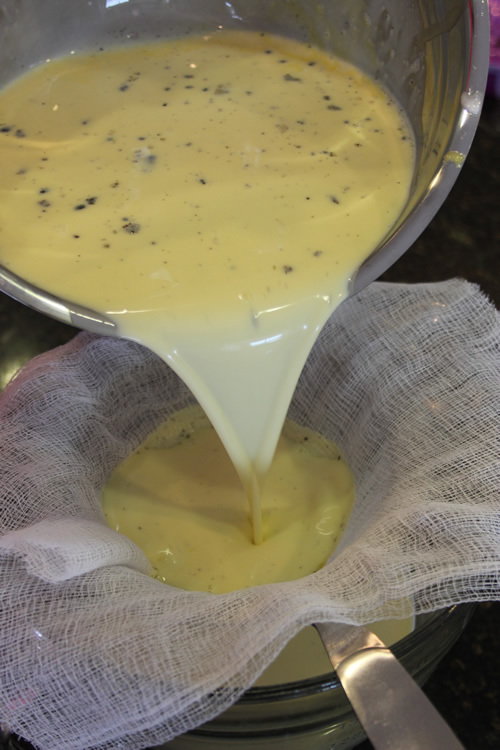 Pour the cream mixture into the sieve. Here is what you have left in the sieve. You can toss these remains in the trash. 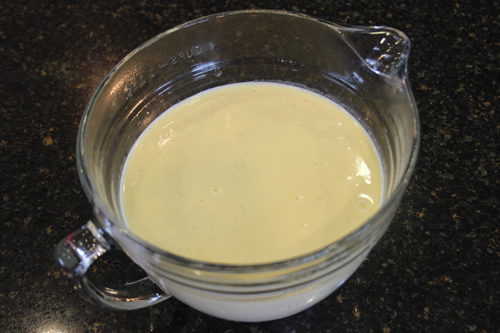 And here is your beautiful, flavorful cream mixture. Line a baking dish or large cake pan with a dish towel and place the ramekins on the towel, leaving space in between them. Depending on the size of your baking dish and your ramekins, you may need to use two baking dishes. The towel hold the ramekins in place while you move them in and out of the oven. 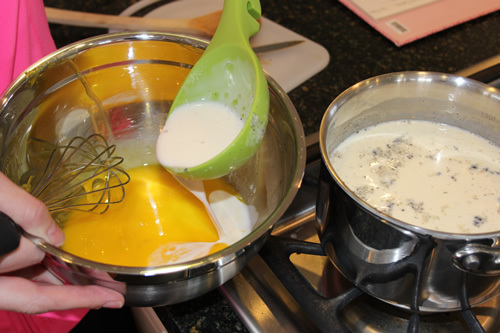 Pour the cream mixture evenly among the ramekins. Fill a kettle with water and bring to a boil. Place the baking dish into the preheated oven and pull the oven rack part way out, with the dish on it. Carefully pour the boiling water from the kettle into the baking dish, making sure not to pour any water into the ramekins. The water should go about half way up the sides of the ramekins. 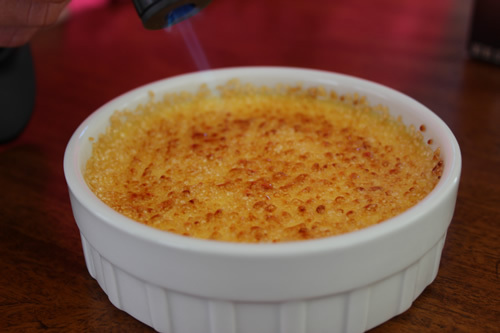 This creates a hot water bath which allows the creme brulees to stay creamy while baking. Push the rack back into the oven and bake at 300 degrees for 20-30 minutes. Start checking for doneness at 20 minutes. They are done when the edges are firm but the center still jiggles. Be careful when removing the baking dish from the oven so that you don’t splash the water out of the pan or into the ramekins. 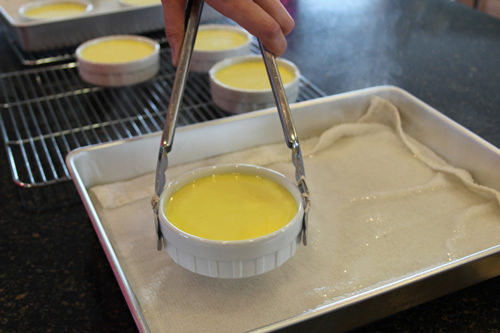 Immediately remove the ramekins from the dish, with tongs, and place on a cooling rack to cool completely. 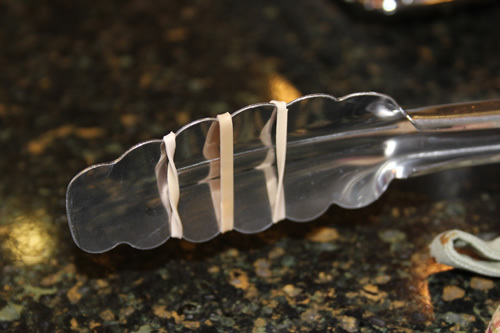 A neat pointer that they taught on America’s Test Kitchen is to wrap rubber bands around the ends of your tongs. This gives the tongs a non-slip grip and allows you to easily remove the ramekins without fear of dropping them. Allow the ramekins to cool on the rack for about 2 hours. Don’t they look yummy already? 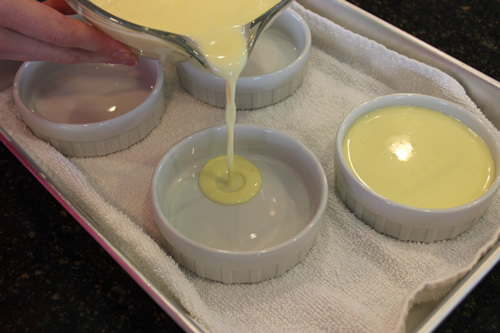 Once completely cooled, cover each ramekin with plastic wrap, gently laying it on the surface of the custard. Refrigerate for at least 4 hours. They can stay in the refrigerator up to 4 days if you want to make them ahead of time. Now comes the fun part! 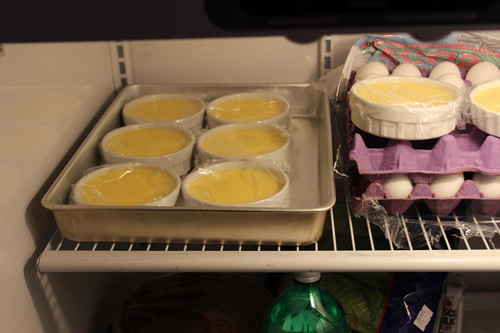 About an hour before you want to serve them, pull the custards out of the refrigerator and remove the plastic wrap. Use a paper towel to dab any excess moisture that may have developed on the tops. Pour about 1 1/2 teaspoons of the turbinado sugar on to the top of each ramekin. I don’t measure it out, I just pour straight from the box. 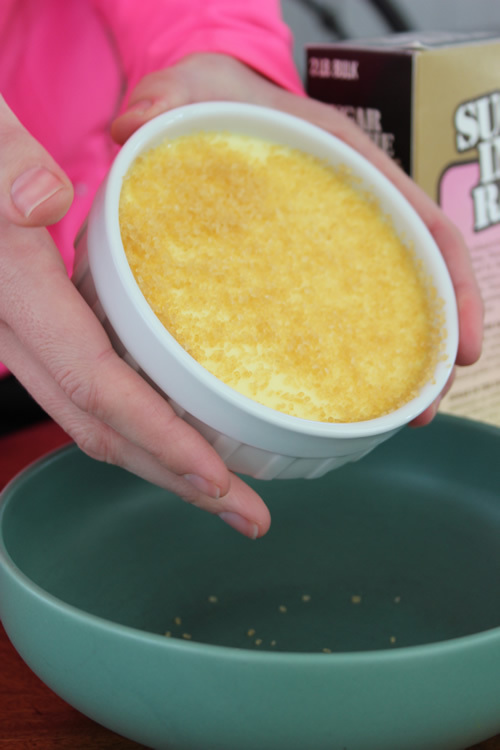 Rotate the ramekin in your hand, allowing the sugar to move around and cover the entire surface. And here it is completely covered. If you have too much sugar, pour off the excess. If there isn’t enough then add a little more, making sure the entire top of the custard is covered in sugar. Now you get to bring out the flame!! 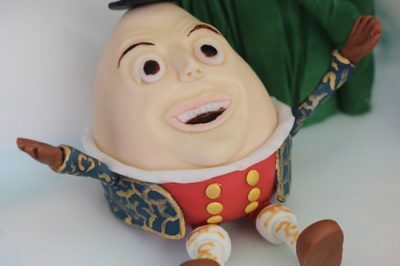 I know this is the part you have been waiting for. For this picture I used my small kitchen torch but I actually prefer to use my husband’s Bernzomatic plumbing torch from his garage. The flame on the kitchen torch just doesn’t seem to get hot enough to do a very good job, especially when you are trying to brulee eight desserts at a time. My husband’s torch has a much hotter flame and makes the job a lot easier and quicker. 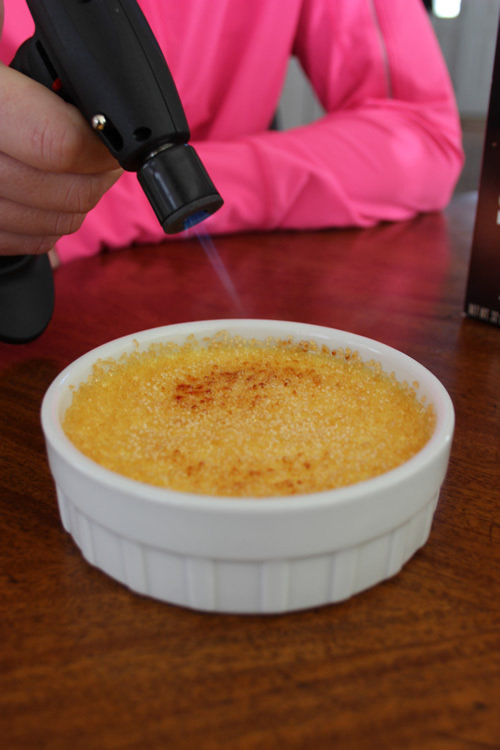 To brulee, get the flame close enough that it starts melting the sugar but don’t touch the sugar with the flame. Start on the edges and melt the outside of the creme brulee then work your way to the center. The sugar will turn a beautiful dark brown color as it melts. 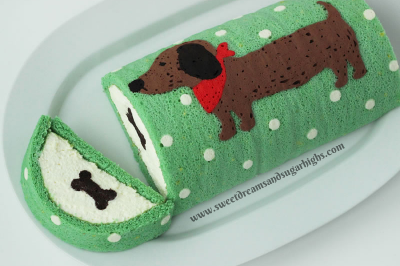 I’m getting hungry just looking at this! 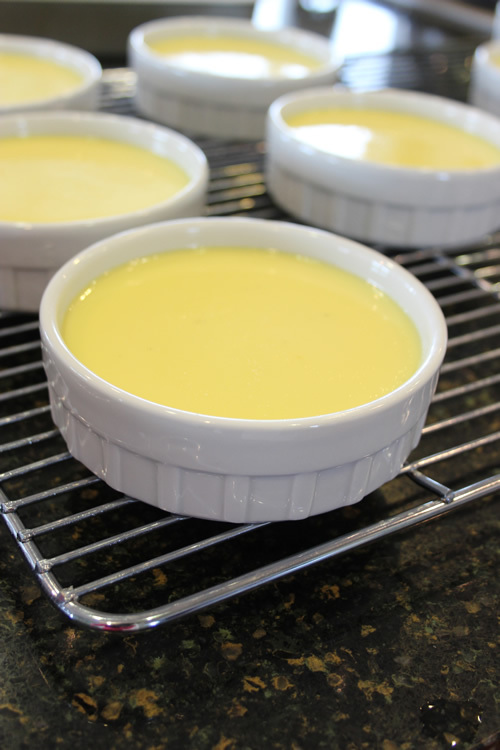 When the entire top is melted, place the ramekin back into the refrigerator to allow the custard to firm up and the sugar to harden. Refrigerate for about 45 minutes. 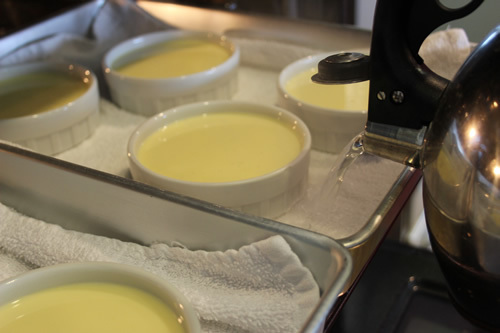 Don’t let the ramekins set for more than a couple of hours in the refrigerator at this point because the sugar will start to break down and liquify, leaving a watery top on your creme brulee and turning the custard an ugly brownish color. 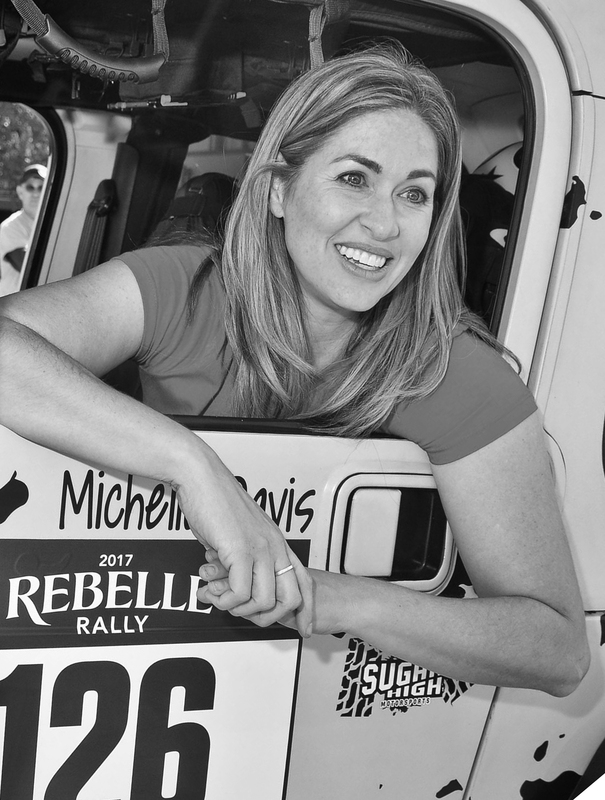 So much vanilla and sugary goodness all in one little dish. 325 degrees for 30 minutes, minimum, trust me.